It’s been a long, strange road for Matter Center for Office 365, Microsoft’s practice management platform, but there is good news at last, as it finally becomes available in the cloud to law firms of any size. It was January 2015 when I first reported that Microsoft was quietly preparing to launch such a platform. Originally designed for Microsoft’s in-house legal department, the company decided to make it commercially available to law firms and legal departments. A year ago, it announced that it had started shipping Matter Center to IT resellers who serve the legal industry and that firms could purchase it through those resellers. Then, last December, Microsoft posted the Matter Center source code on the developer site GitHub, indicating that it hoped outside developers and partners would participate in further developing the software’s capabilities. One company that took Microsoft up on that offer was CloudTitan, which specializes in creating cloud automation services for Microsoft channel partners. It took the GitHub code, built out its functionality, and is now offering the first turnkey Software as a Service (SaaS) version of Matter Center. 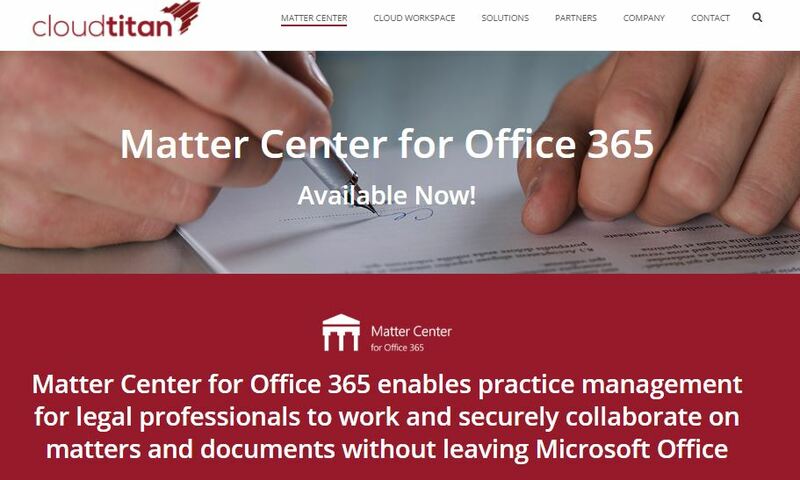 Matter Center is an add-in for Office 365 that provides document management, case management and collaboration tools for legal professionals. A key advantage is tight integration with Office 365’s productivity applications and with Sharepoint and OneDrive, so that emails, documents and tasks are all integrated with your matters. A significantly improved user interface (due within the next two weeks). A mobile client. It currently works through a mobile browser, but a dedicated mobile client will be available later this year. Skype for Business integration, to record call time directly to a matter. Forte believes that CloudTitan’s version of Matter Center will be most attractive to small and medium-sized firms. To use it, a firm must have an Office 365 Enterprise E3 subscription or higher. (The E3 subscription is $20 per user per month with an annual commitment.) Matter Center would be an additional subscription of $50 per user per month, which is in line with the price of other practice management systems. As is common with Office 365 add-ins, Matter Center will be sold through Microsoft’s global reseller network. That ensures that law firms anywhere in the world have local sales and support people to work with, Forte said. Customers will get one bill that combines Office 365 and Matter Center, as well as one support number for both products. Why would a firm choose Matter Center over other practice management platforms on the market? I asked Forte. I have not yet seen a demonstration of Matter Center but Forte has promised to give me one sometime in the next few weeks, once the new UI is rolled out. Once that happens, I’ll provide more details here.